Apples and Honey – the traditional foods to eat together to express our hopes for a sweet year to come. 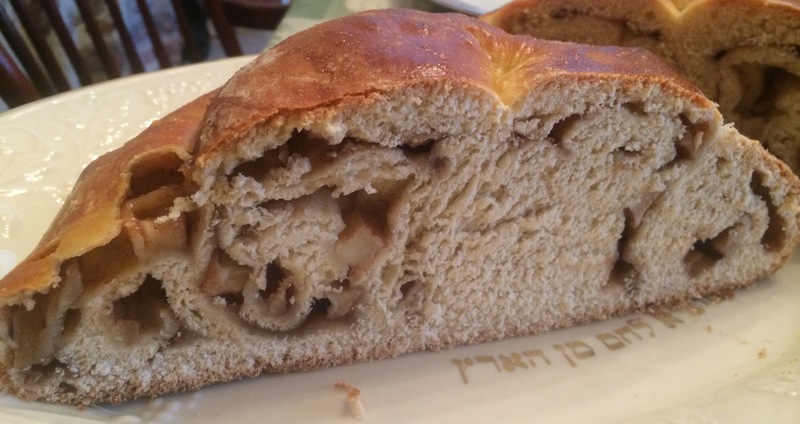 So, why not combine the two in one challah? I used the dough recipe from the date challah, since it was so delicious. And this challah was just as delicious, it was a hit with everyone. We love the swirls of apple and cinnamon sugar; it seemed to get even more swirly and apple-y with each slice. In a large mixer bowl, combine the yeast mixture with remaining honey, 1/3 cup olive oil, and eggs. Add the salt and flour, and mix until dough begins to hold together. Switch to a dough hook, and run at low speed for 5 to 8 minutes. Transfer the dough to an olive-oil coated bowl (or rest the dough briefly on the counter and oil your mixer bowl to use for rising, so that you’ll use fewer dishes), cover with plastic wrap, and set aside for 1 hour, or until almost doubled in size. In a small bowl combine the sugar, brown sugar, cinnamon and flour. Set aside. Roll the dough into a 22” inch long log. Roll the dough into a 22” x 10” inch rectangle. Sprinkle with ¼ of the cinnamon-sugar mixture. Evenly top with half the diced apples, then sprinkle an additional ¼ of the cinnamon-sugar mixture over the apples. Tightly roll the challah (like a jelly roll), pinching along the seam and ends to tightly seal. 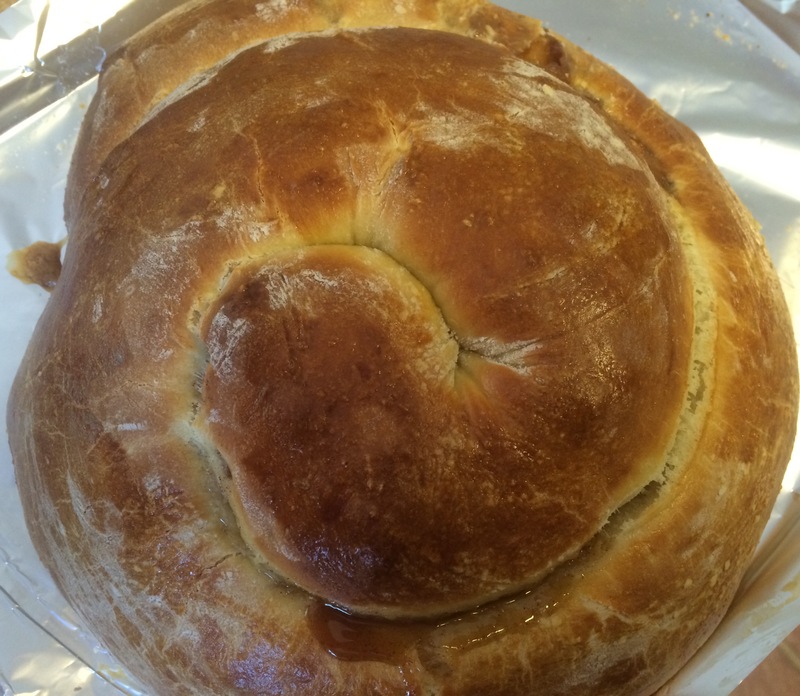 Wind the challah into a circle, tucking the end under the challah for a clean finish. Place challah on baking sheet. Cover and allow to rise for 30 minutes. Brush with egg wash.
Bake for 40-50 minutes until deep golden brown.